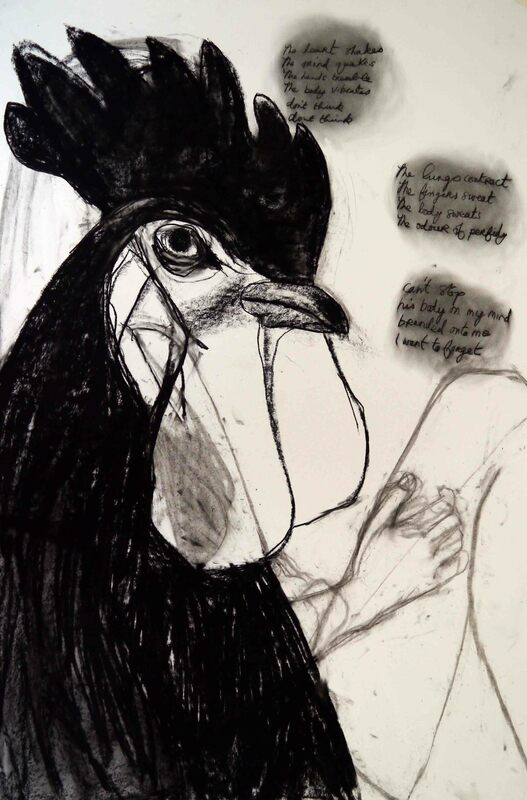 This latest body of work from Suzy O’Mullane is immediately striking in its vigour and forceful physicality. There was Nothing Good About Good Friday is characterised by the sinuous muscularity of her drawing, the solidity of her figuration, the vibrancy of her palette, and the stark simplicity of her composition. The exhibition is accompanied by a text written by the artist which makes explicit its origin. In prose as compelling as her visual aesthetic, she details with a bracing emotional candour the traumatic breakdown of a relationship and its turbulent aftermath. This supplement effectively structures the work for the viewer and also perhaps colours our apprehension of it. It might lead us more readily into interpreting in a particular way these ambiguous motifs, or the volatile liquidity of the layers of paint that leak and bleed in unpredictable runnels like weather systems across her surfaces. However, the access to her vulnerability afforded us by this text also contrasts in a satisfying way with the fierceness of her graphic register. O’Mullane’s painting sits within a lineage that reaches right back through the twentieth century, calling to mind the visceral expressiveness of Frida Kahlo or Edvard Munch, and more particularly, the confrontationally ‘confessional’ art of Tracey Emin and Louise Bourgeois. This is work that is linked to self-reflection and exposure, or what Marina Warner called ‘self-revelation and public intimacy’ . Both Emin and Bourgeois are artists that O’Mullane admires, and who, like O’Mullane, make art that draws on an exteriorization of intimate emotional experience. All three also incorporate their work with fragments of text – in several of these paintings or drawings, O’Mullane punctuates the expanse of her gently modulated surfaces with single words, or phrases, that emphasise the emotional urgency of the images. Bourgeois spoke and wrote copiously about the origins or motivations behind her work, which often stemmed from traumatic childhood memories. Because she yoked her oeuvre explicitly to her biography, or more accurately to the richly compelling myth she wove from her biography, it has led many artists to interpret her work psycho-biographically, or to view her work as a ‘symptom’ of a lifelong psychic torment. This is ultimately unsatisfying – it is not sufficient as an explanation of her work, or of Suzy O’Mullane’s. To write off artwork as simply a symptom of suffering, is to dismiss it as akin to some kind of uncontrollable side effect or unconscious emission rather than a product of decision and consideration. Alex Potts has argued that Bourgeois deliberately deployed her carefully constructed biography to ‘function as provocation’ which serves to structure the viewer’s experience of the work as ‘psychodrama’. Similarly, O’ Mullane’s text offers the viewer an entry into her work – which, for all its blistering honesty, is couched in a personal iconography that remains satisfyingly ambiguous. In Crow, Gladiolus, Cage, for example, a dark mass swells and bursts, its tongue-like petals painted in veils of softly transparent black, layered over blue and purple. The thunderous bloom sits beneath a bird surrounded by a thick border of pale blue, wings outstretched, the bird seems headed toward a distant yellow cage. In Wolf, Jellyfish, Black Gladiolus, the same flower, now articulated with silvery pink striations, appears above an abbreviated elliptical shape that emits a hank of limp red tendrils. To its right, a wolf with one glowing red ear is incised like an icon against an impenetrable background of gold leaf. Another canvas, I Would Honour You, depicts a Christ-like figure outlined in a nauseous green is submerged to his lips beneath a transparent blue field – dripping bands of dark blue compress the figure from above, while a small bird, perhaps a hawk seems to push the word honour into the darkness. Each seems to play out some portentous narrative, compelling but also elusive. Biblical references are also prevalent; the title of the show makes explicit reference to the Christ’s Passion for example, and elsewhere she freely appropriates elements of religious imagery and iconography which are mobilized for pleasingly insurrectionary ends. Flame incorporates the face of St. Thérèse, taken from a photo of the woman at 19, before she entered the convent. This face is another recurring motif in O’Mullane’s work, and she uses it to deliberately challenge traditional depictions of women within the Irish Catholic tradition. Female saints are often ‘wimpified’ to use the artist’s own expression, when in fact they were warriors; tough and often physically as well as emotionally brave. Even more deliciously subversive is the artist’s use of her own disguised self portrait which appears in I Killed a Snake, and I Would Honor You, both half-length studies of a coyly seductive Christ-like male. The interpretive possibilities are rich here, bringing to mind ideas of suffering and betrayal, undercut at the same time by her sly, tongue-in-cheek humour. O’Mullane deploys and reconfigures this religious iconography, as well as the richly symbolic animal presences as a device to frame profound or primal emotional states. This is a visual vocabulary perfectly suited to cope with the emotional tenor of this work –to convey depths of grief, to communicate a cris de coeur– but also, finally, strength and resilience. O’Mullane ultimately belongs to a group of artist storytellers, such as Kahlo, Bourgeois and Emin – in that she that she thinks with and through the body. She has always been interested in figuration and in drawing from life and her treatment of the body is distinctive and compelling. The figure appears mostly in half-length studies, two of a Christ-like male and others of girls; all sharp cheekbones, watchful expressions and curtains of straight dark hair, all simply articulated with confident yet elegant economy of draftsman-ship. It is a characteristic of this work in particular that all of these bodies; human and animal, are surrounded by thick contour lines that seem to act as a force field or a protective shell. Sometimes these insistent outlines are executed in a vividly contrasting colour, such as the band of pink that separates Harmonie‘s pensive girl from the livid red washed background. In others, such as I Killed a Snake, the gold strip surrounding the figure seems to be an extension of a halo. In all of the works though these protective contours isolate the figures and animals as much as they insulate them. Even in works where more than one presence, human or animal, occupies the space, as in Brain for example – they are remote from each other. Only in drawing, Ecstasy, do two bodies connect – two dogs dissolving into a one charcoal mass, the outlines smeared so that the shapes bleed into the background. For the most part though these bodies are defiantly and assertively separate, contained within an outline at once like a carapace, but also like a cordon sanitaire. Although There was Nothing Good About Good Friday stems from a deeply personal event, this exhibition is far from a solipsistic picking at the scabs of a broken heart. Instead, O’Mullane has presented us with a bracingly honest exploration of the universal experience of grief, told with a characteristic balance between intensity and restraint. Moreover – as much as it is about pain, this work is also an affirmation and a celebration of resilience and strength. Marina Warner, ‘At the Hayward’, The London Review of Books, Vol. 33, No, 16, 2011, pp. 28-29, 28. Sean Kissane, Signs, Blue Leaf Gallery, Dublin, 2010, unpaginated. Sarah Kelleher is a PhD Candidate, History of Art, University College Cork and CACSSS Postgraduate Scholar. She also writes critical essays for the Irish Museum of Modern Art.